The potential game as a special type of game, compared to other types of game, has the finite increment property, the existence and uniqueness of Nash equilibrium and other good properties and can be used to solve the problem of resource allocation in cognitive radio networks (CRNs). Broadcast retransmission is a important function in CRNs, which need to be optimized in order to improve the efficiency and utilization of the networks. When packets failed to reach some receivers in broadcasting, retransmission occurs. Choosing an appropriate channel to delivery packages is critical to the efficiency and quality of data retransmission. 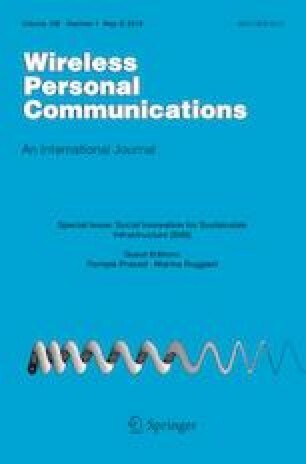 In this paper, first, we establish a potential game model for broadcasting retransmission by taking into account of energy consumption and interference in the design of utility function and potential function in spectrum allocation. Then we propose Potential Game-Broadcasting Retransmission Algorithm (PG-BRA) based on potential game model. In PG-BRA, two broadcast retransmission mechanisms are designed to avoid “conflict” problems, named FRM and DRM. FRM is more suitable for static network topology and DRM is more suitable for dynamic network topology. The simulation results show that the PG-BRA proposed in this paper can effectively work in terms of packet reach rate, average retransmission times, average delay and the total transmission power of system compared with existing broadcasting scheme. This work was supported by the Science and Technology Fundament Research Fund of Shenzhen under Grant JCYJ20160318095218091 and JCYJ20170307151807788. Al-Imari, M., Ghoraishi, M., & Xiao, P. (2015). Radio resource allocation for full-duplex multicarrier wireless systems. In: Proceedings of the International Symposium on Wireless Communication Systems (Vol. 2016CApril, pp. 571–575). https://doi.org/10.1109/ISWCS.2015.7454410. La, Q. D., Chew, Y. H., & Soong, B. H. (2009). An interference minimization game theoretic subcarrier allocation algorithm for OFDMA-based distributed systems. In: GLOBECOM—IEEE Global Telecommunications Conference. https://doi.org/10.1109/GLOCOM.2009.5425911. Chang, B. J., Liang, Y. H., & Huang, Y. D. (2017). Efficient emergency forwarding to prevent message broadcasting storm in mobile society via vehicle-to-X communications for 5G LTE-V. In: Proceedings—2016 International Computer Symposium, ICS 2016 (pp. 479–484). https://doi.org/10.1109/ICS.2016.0102. Xiao, X., Yang, L. M., Wang, W. P., & Zhang, S. (2008). A wireless broadcasting retransmission approach based on network coding. In: 2008 4th IEEE International Conference on Circuits and Systems for Communications, ICCSC (pp. 782–786). https://doi.org/10.1109/ICCSC.2008.171.